I made a trip back home to Missouri this past weekend. My sister, niece, her baby, and I went to see the beautiful lights at Silver Dollar City. I love the barn of decorated Christmas trees... they are so gorgeous! I put up a cardinal tree every year in my home. It's not near as big and beautiful as this one though, ha.. It was such a clear but chilly night. You can only imagine how the 6.5 million lights shone so brightly. I was in awe just as much as kids. Even though there were lots of people there, it sure didn't seem like it at times. It was almost as if we had the place to ourselves... which added to the magic of the night. My favorite part of the City, now that I'm older, is the shops. I did love the rides more as a kid but I have definitely outgrown that, lol! So it was nice to just take our time, take in the beauty of the lights and check out the shops. Isn't this macrame just the cutest?! The next day, I went to Branson Market Days... a handmade and vintage show with a different sister and nieces. We had such a great time! They didn't want their picture made with Santa, but I made them, hehe! How could you not with that awesome old farm truck, come on now!? Santa was a little on the skinny side but it was a great way for us to get a group photo. With every trip back home, it makes me miss it more and more. 😢 Thankfully, it's only about 3 hours away. I'm going back again this weekend, as my parents always have their Thanksgiving celebration on Saturday. Thanksgiving Day will be spent with my husband's family and our kids. We had our first fire of the season to go along with the first snow of the season today. Even though the weatherman said we would get anywhere from a dusting to 5", it was still a nice surprise to wake up to a blanket of white... you just never know with our crazy Oklahoma weather. But by the time I decided to take pictures, it was already starting to melt. 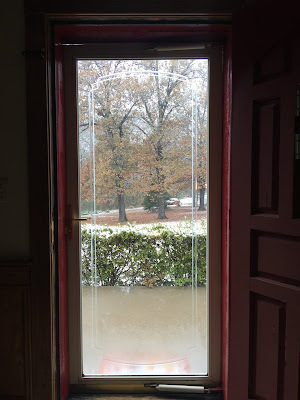 This is looking out the front door. Sweet Rich fixed breakfast for us since he was off today. Then he made a big crockpot of chili so it was nice for me to have a day off from cooking! Then this view is out the garage door, looking into the back yard. With the leaves falling, we can see more of the pond now. When the latest iPhone update added the screen time feature, I was appalled at the amount of time I spent on my phone. Holy moly! So I've been making a conscious effort to reduce my screen time. 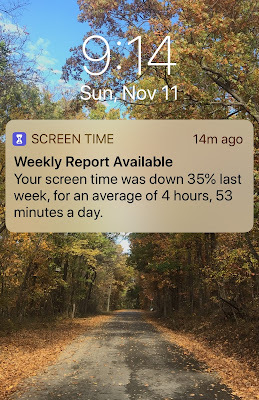 I was pretty proud of myself for the weekly update that showed my screen time for the last week. But still... almost 5 hours a day?? Ugh! Why have we become so dependent on our phones? My new motto.... less technology and more relationship, more intent, more living, more purpose, more joy. This blonde coffee table belonged to my nephew and his wife. They were getting rid of it, so I brought it home. For years, it made its place in our home in the living room. But it was time to make some room when my mother-in-law gave us an old wardrobe trunk that belongs in her family. I lightly sanded it down. 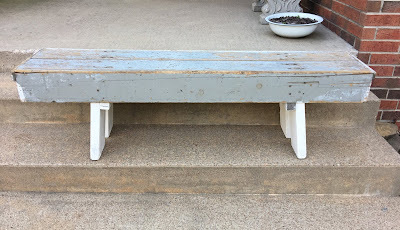 Then painted it with a white chalk paint that I slightly distressed. After taking off the casters and adding beautiful blue glass knobs, I love the way it looks now! I forgot to take pics before I took it to the booth. But if I would have had room... that beauty would have stayed at my home, lol! 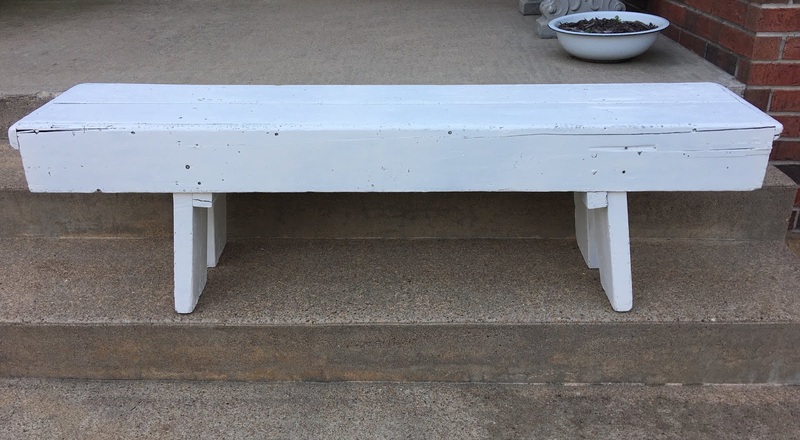 In my Grandma's garage was this old bench that my aunt was going to throw away. Nooo! It took the trek from IL to OK so I could bring it to my home. Since this was going in my home, I was fine with doing a quick job on it. The only prep work I did was to hose it down with the water hose and scrub it with Dawn dish soap (for grease since it was in the garage). I wanted to give it a dry brush look with the beautiful gray peeking through but it was too shiny for the paint to stick where I wanted. So I ended up giving it an all over sloppy paint job. In the end, I like this look much better than what I was originally going for. It now serves as a coffee table in our family room, along with the rest of our family treasures. Since the kids use the table and another coat of paint could be in the future, I didn't even seal it. And because I just love looking at before & after photos, I made a few to go along with this fun project. I finished a project last week. Finally. So I bought this stool last year at a garage sale for $2. Yes, I couldn't believe it either... only $2! It was really sturdy and really heavy. I ripped off the carpet that was on it. And decided to change it out to a round seat, and make it a bigger seat. So my husband cut a circle out of plywood and screwed it to the base. I spray primed the metal base. My new favorite color was added to bring some life to my junk room... aqua! 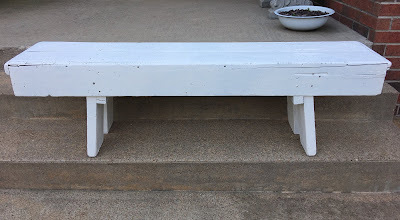 I spray painted the legs with Rustoleum Seaside. I found some beautiful, bright colored fabric in my junk room color theme... red, aqua, and yellow at our local quilt shop and covered the stool. The thrill of finding a great piece at a great price is so awesome! But when you actually get to see the transformation come alive... it's very exciting! Along this journey of life, I have surrounded myself with worn, well loved vintage pieces. Thankfully I was born into a family of creative women all around me... therefore I love to create. When I intermingle these loves, it becomes a passion for the hunting and creating that molds my booth at The Cranberry Merchant in the heart of Claremore, OK. Originally from Missouri (the Branson/Springfield area), I now live in Oklahoma. My life revolves around God, family, friends, and home.
" The Homespun Loft "